Nagle argues the country cannot expect a woman who "lies about her own history" to lead the nation. She said Warren's cultural appropriation "directly contradicts the progressive agenda she preaches." Warren's ancestry could prove problematic if she decides to run for president in 2020. President Donald Trump has already branded the Massachusetts Democrat "Pocahontas" for embellishing her Native American roots. "Warren's ancestry first came under scrutiny in 2012 after it was revealed that she was listed as a minority in a directory for the Association of American Law Schools when she taught at Harvard in the 1990s," she said. "Warren proudly claimed that she is of Native American descent in a 2012 interview with NPR." Nagle says it is not enough that Warren has backed off her full-throated ancestry claims and now only claims to be "part Native American" or a woman with "Native heritage." "Warren has never stopped claiming her family is Cherokee and Delaware, despite having an enormous amount of evidence that says otherwise," Nagle said. Nagle adds it is wrong for a "white woman who claims to be ‘part Native' based on no evidence outside of family lore" to receive broad support. "The fact-driven watchdog senator needs no proof," Nagle said. "She said she knows who her family is and ‘no one can take that away.'" Nagle points out the fact that Warren and her family are not on any Native American census rolls, which raises a "red flag." But the most problematic point is Warren has zero Native ancestors. 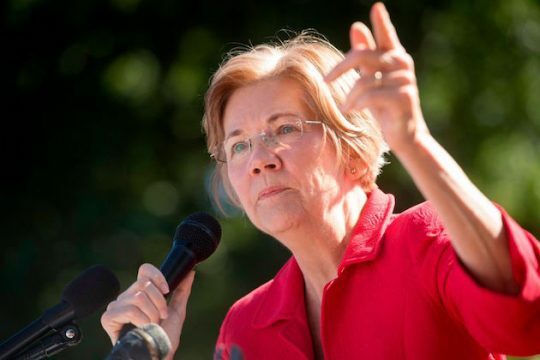 "Some reports say that Warren is 1/32 Native American through her great-great-great-grandmother, who was described as Cherokee on her marriage license application," Nagle said. "But the original application and marriage license have never been found to corroborate this story told in Warren's family." Nagle continued: "Her family history is not a mystery; her genealogy has been traced back to before the Trail of Tears to Revolutionary America, and no evidence of Native ancestry has been found. Her family is completely absent from over 45 records and rolls of Cherokee people from 1817 to 1914. In the same period, before Cherokees were citizens, her relatives appear in multiple U.S. censuses as white." "We cannot continue to put people in power who show blatant disrespect and disregard for some of America's most vulnerable residents," she said. This entry was posted in Politics and tagged Elizabeth Warren. Bookmark the permalink.